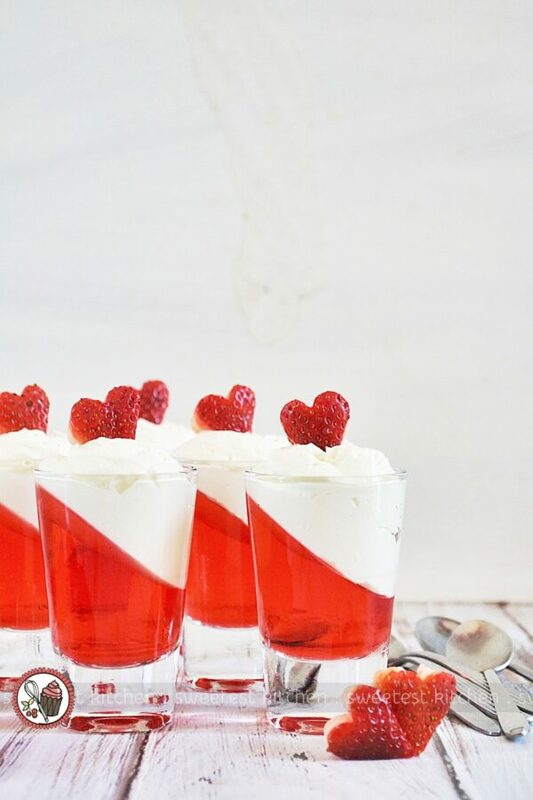 Using just a box of Jell-O and some whipped cream, you can create this fun and easy treat for that special someone in your life! 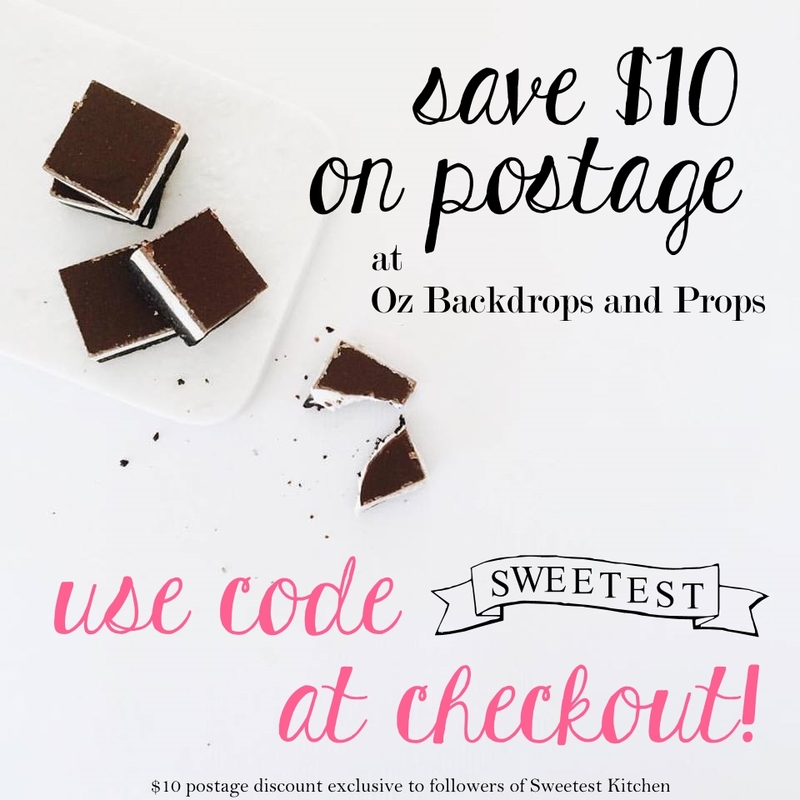 I originally intended on this post being about these gorgeous Valentine’s Day treats, but then I realized that I really need to welcome everyone to my new “photography studio”! I’ve lived in this house for 5 years and have been under the impression that the only good spot to do food photography was at the dining room table, which is opposite a large sliding glass patio door. It lets in a lot of light, but it’s a harsh light at times, especially when it’s full-on sunny. I scrapped together a homemade light diffuser last year to help soften the strong light, which was great. Fast forward to the end of Christmas… I was just randomly standing in our lounge room (which is basically a rumpus room), where we put our Christmas tree, one day, doing nothing in particular. I glanced at the fireplace and noticed how bright it was. Hm. There is a large window on either side of the fireplace; both of those windows are covered by a white, sheer curtain. Um, instant light diffuser? Haha! So, during my next photography session, I took everything to the lounge room and discovered that the fireplace is the perfect place to photograph food! 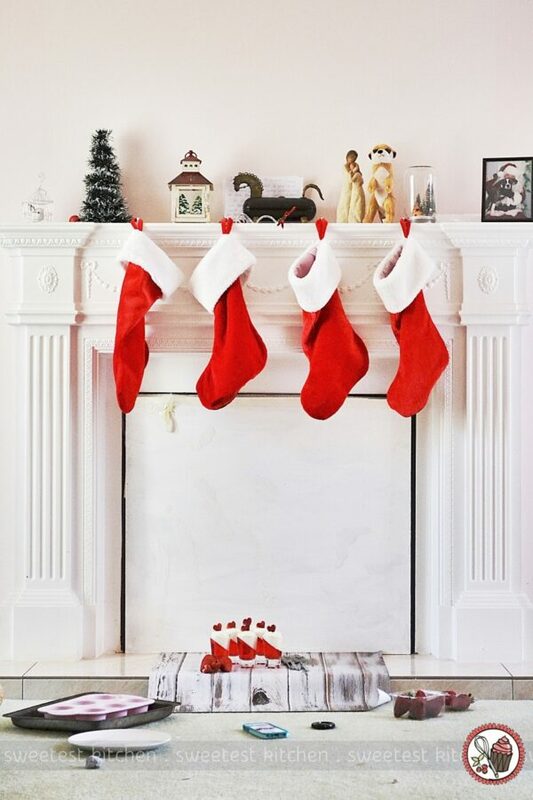 My latest three posts have been photographed at the fireplace! 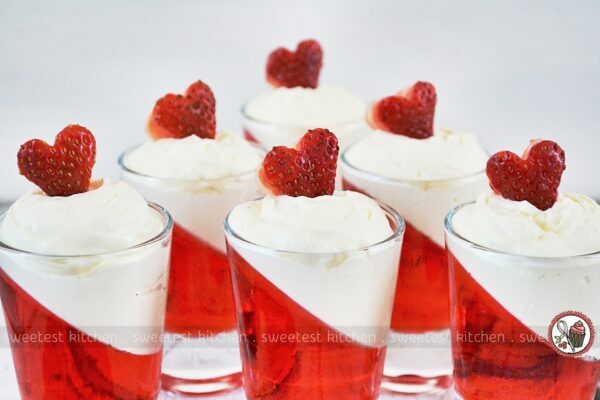 Anyway, now back to these Valentine’s Day Strawberry Jell-O Shots! These were super fun to make and so easy! 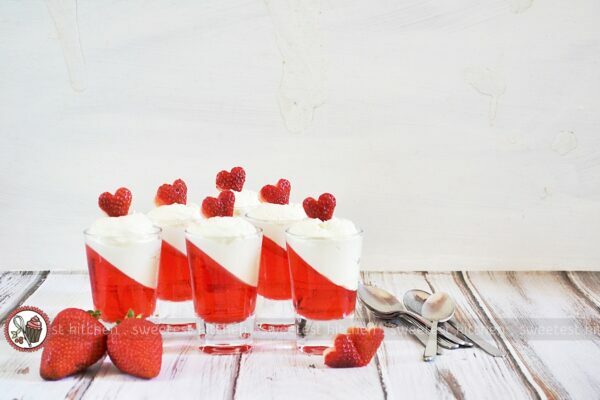 All you need is a box of Jell-O and some whipped cream, plus a cupcake baking pan and shot glasses. Oh, and some strawberries! Begin by setting out a cupcake baking pan and at least 6 shot glasses (this recipe can make 8-10 average shot glass-sized servings). Prepare the Jell-O following the instructions on the box. Transfer the prepared Jell-O to a measuring cup, or any cup with a pour spout. Fill each shot glass 1/4-1/3 full of the Jell-O; hold the glass at a slight angle when pouring to make sure the Jell-O won’t spill over when placed into the cupcake pan. When filled, place the shot glass, on its side, into the cupcake pan. Repeat with the remaining Jell-O and shot glasses and place the cupcake pan into the refrigerator for at least 2 hours to set. 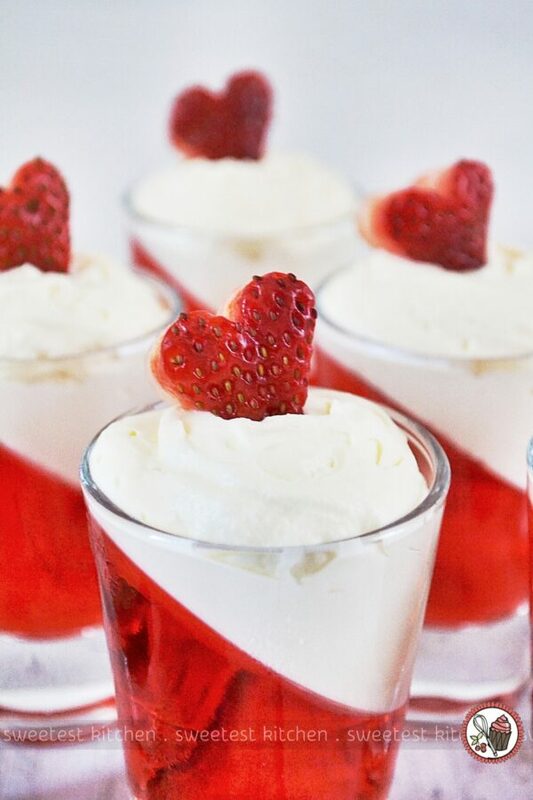 Meanwhile, when the Jell-O has set, prepare the whipped cream. You could use Cool Whip or any other prepared whipped cream, but I prefer homemade. Combine thickened cream (heavy whipping cream), powdered sugar and vanilla extract in a chilled bowl then whisk with an electric mixer to stiff peaks. Transfer the whipped cream to a piping bag and pipe it into each of the shot glasses. You can also just spoon it in; these shots are pretty fancy-looking no matter what you do! To make the heart-shaped strawberries, I used a small heart-shaped cookie cutter to cut shapes out of halved strawberries. Ta-da! These look so impressive and so pretty! Absolutely perfect for your loved ones on Valentine’s Day, right? Place 8-10 shot glasses into a 12-cup cupcake baking pan so that the glasses are tipped on their sides. Set aside. Prepare jelly according to package directions. Transfer jelly to a cup or jug with a pouring spout and carefully pour the jelly into each of the shot glasses. If you find it easier, lift out the shot glass, keeping it sideways, and carefully pour the jelly into the glass while holding it, then gently place it back, sideways, into the cupcake pan. Pour the jelly almost up to the rim of the glass while the glass is on its side. Refrigerate the jelly for at least 2 hours, or until firm. 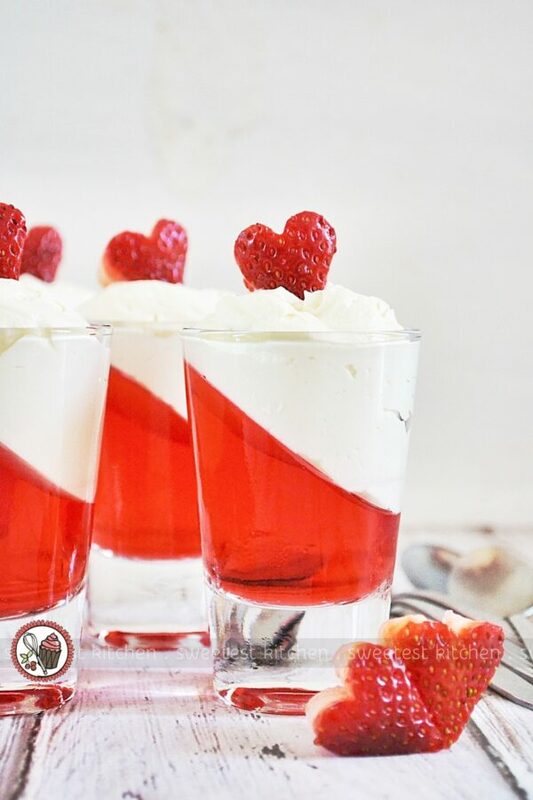 Just before you take the jelly out of the refrigerator, prepare the strawberry hearts. Cut the tops off the strawberries and slice the strawberries in half. 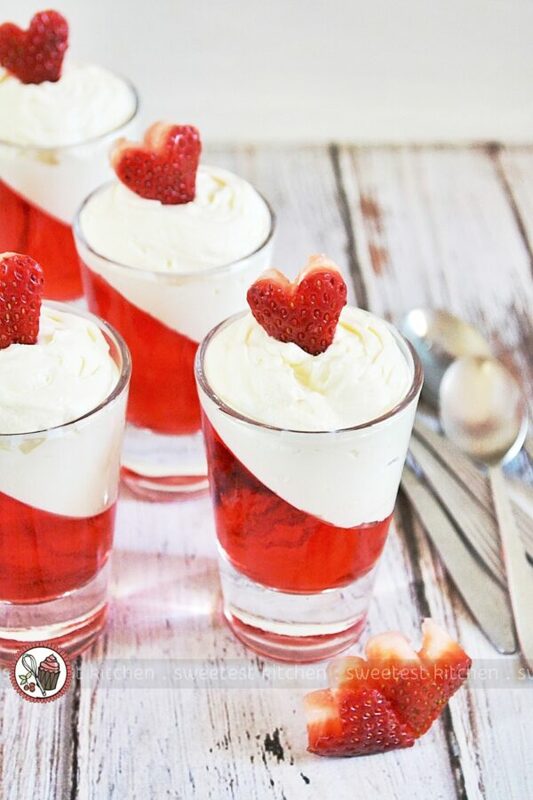 Place the strawberries cut-side down, and using a small heart-shaped cookie cutter, cut hearts out of the strawberry halves. Set aside. Pour the thickened cream into a medium bowl. Sift over the powdered sugar and add the vanilla extract. Whisk the cream to stiff peaks (using an electric mixer, or by hand), being careful not to overbeat the cream. Transfer the whipped cream to a piping bag and cut the tip off (leaving an opening somewhere around medium-sized, but not too big). Pipe a circle of whipped cream around the edge of the jelly, next to the glass (I found that this helps eliminate pockets of air around the top edge of the jelly layer). Then place the piping bag tip in the middle of the circle and squeeze out the whipped cream until it reaches the top of the glass. Feel free to use a star tip, or do some fancy swirls, if you like! You can also just spoon it into the glass, either way will still look great! 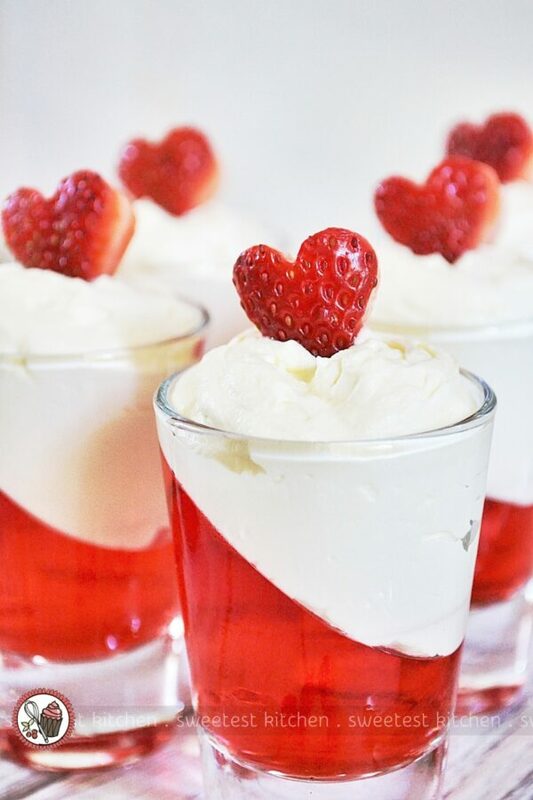 When finished piping all of the whipped cream, gently place a strawberry heart in the middle of each mountain of whipped cream. Serve immediately, or refrigerate up to 6 hours, covered. * You can also use thawed Cool Whip, if preferred, or it's is easier for you.